I was on an HP supercell in SW IL from near Dupo to east of Pinckneyville. It never could quite tornado, but did produce wind damage in Jefferson Co., MO and in Randolph and Perry Counties, IL, as well as flash flooding in south St. Louis Co., MO and in Perry Co., IL. As it collapsed around 5 p.m., it dropped in 2.75 inches of rain in 30 minutes in Cuitler, IL. I had been watching conditions for a possible local chase, since with a baroclinic zone approaching from the northwest, various frontal and outflow boundaries scattered across MO and IL, and an approaching shortwave trough, the area had a pretty good chance of SVR - though the chance of tornadoes looked rather limited. Still, there looked to be enough shear to get a few storms rotating, so I had hope. Best instability looked to be SE of the STL metro area. Around 2 p.m., SPC in rapid succession issued a MCD then a SVR watch for eastern and SE MO and SW IL. Watch was valid until 9. Quickly a number of small, isolated, strong storms fired W and SW of the STL area. I left my office figuring to check conditions and head out for a chase when I got home. I especially was considering an isolated cell at the southern end of the cluster, which seemed to moving to the right relative to the ENE movement of most of the storms. When I got home, I was startled to see that a TOR warning had already been issued for St. Charles Co., MO. There was a small, strong cell there that had a bit of a hook and seemed to be moving due E. The storm farther south was not as strong now, and soon a second TOR was issued on the St. Charles Co. cell, now for parts of St. Louis Co. I figured the eastward movement of the storm would take it about over downtown STL and then along the Madison-St. Clair Co. line in IL, so I headed out to intercept there, just north of the intersection of IL 157 and I-64. By the time I got there, a new TOR warning had come out for a cell to the south, with rotation near Eureka, MO. I changed strategies and decided to intercept the new storm around the Columbia, IL area, since this southern storm would get more unsbable inflow and seemed to be merging into the northern one. Although the reported movement was slow enough that I thought I could get in position ahead of the storm by heading south on I-255 and exiting on route 3 at Columbia, it becamse evident as I reached the Centreville exit (route 157) that if I proceeded any further, I would be in the core of the storm, which by now looked very HP. Greenish precip shafts were just ahead of me, over about Dupo, and the updraft appeared to be on the front flank of the storm, just to my SE. CGs were now hitting all over the area just ahead of me. So I reversed course at this exit, returning northward on 255 to take route 15 SE to get back ahead of the storm. No sooner was I back on I-255 heading north than the alarm went off on my weather radio announcing a second TOR warning for my storm. This one was for St. Clair and northern Monroe Counties, based on radar indication of strong rotation over Columbia. I was very glad I had turned around! As I worked SE on 15, CGs continued to hit all around me, and I was pelted with very large raindrops but no hail. Eventually I managed to get back ahead of the storm, and stayed just ahead of it the rest of the chase. It was now moving ESE rather than due E, continuing the rightward tendency of all the rotating storms relative to most others that were moving ENE. I observed the lowering in this video capture just west of New Athens, shortly before the second TOR warning issued on the storm expired at 4 p.m. Shortly after this, a new SVR warning was issued at 4:10, for southern St. Clar Co. and northern Randolph Co. The storm now began to change in character to a more outflow-dominated storm, and as it turns out, the storm was going into a collapse process that produced very heavy rain and high winds. Shortly after I crossed into Perry Co, still just ahead of the storm, a second SVR warning was issued covering that county. 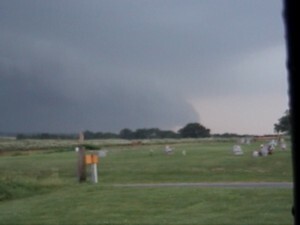 The shelf cloud shown shown here was observed west of Pinckneyville, as the storm produced wind damage near the Randoph/Perry County line. Apparently, this occurred as the storm collapsed in eastern Randolph and western Perry Counties, producing very strong outflow winds and heavy rains. 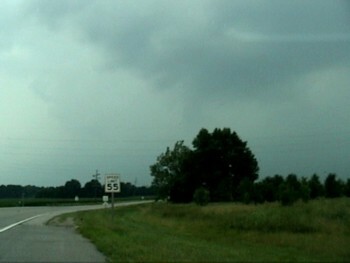 By the time I broke off the chase around 5:20, the storm was very outflow dominant and weakening rapidly. Local storm reports from the St. Louis and Paducah NWS offices can be found here. The reports from Jefferson and St. Louis Counties in MO and Randolph and Perry Counties in IL are from my storm. I may update this report with additional pictures when I get them developed. This page was last updated June 20, 2004.